The Winter Olympics may be making a return to Salt Lake City -- at least the U.S. Olympic Committee hopes so. The USOC announced on Friday evening that they have chosen Utah's capital to pitch to the International Olympic Committee as a host for the 2030 Games. Salt Lake City was chosen over Denver. For now, the USOC is still referring to Salt Lake City as the U.S.'s choice for a "potential" 2030 bid. "I'd like to thank Denver and Salt Lake City, and their respective leadership teams, for participating in this process and their commitment to make the Olympic and Paralympic movements stronger," USOC Chair Larry Probst said in a statement. 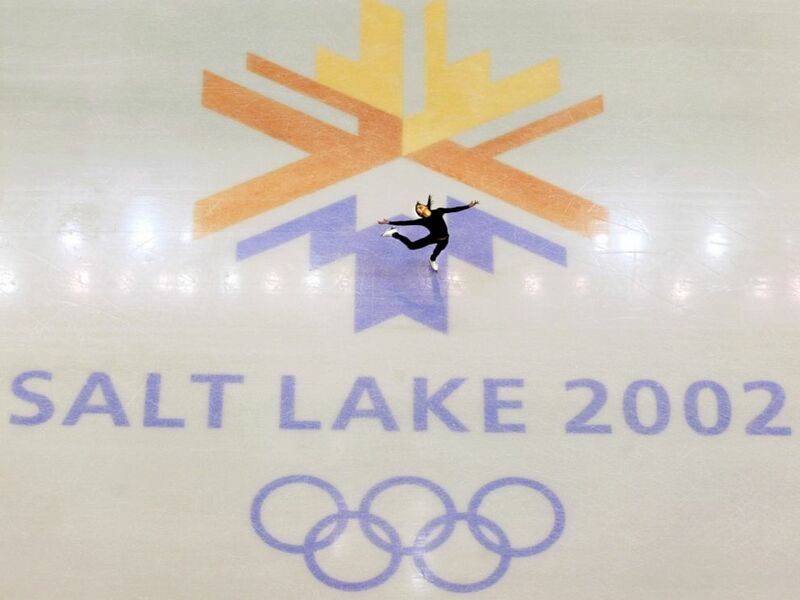 "We're incredibly lucky to have multiple able and willing cities to choose from, but in the end, we believe Salt Lake City will give us the best chance to return the winter Games to the U.S."
In this Feb. 9, 2002, file photo, Georg Hackl, of Germany, speeds past an Olympic logo during a practice run for the men's singles luge at the 2002 Salt Lake City Winter Olympics in Park City, Utah. It's not yet clear what international cities Salt Lake City will be competing against. The selection will not be made by the IOC until 2023. Salt Lake City hosted the Winter Games in 2002. It was the first U.S. city to host the Winter Olympics since Lake Placid, New York, in 1980 -- famously highlighted by the U.S. men's ice hockey's "Miracle on Ice" team. The U.S. has hosted the Winter Games four times: 1932 (Lake Placid), 1960 (Squaw Valley, California), 1980 (Lake Placid) and 2002 (Salt Lake City). Denver, beaten out as this year's U.S. representative, was actually named as host for the 1976 Games by the IOC, before withdrawing four years beforehand. This Feb. 8, 2002, file photo, shows U.S. champion Michelle Kwan practicing for the women's short program for the Winter Olympic Games at the Salt lake Ice Center in Salt Lake City. The 2002 Games, less than six months after Sept. 11, went off without a hitch despite serious security concerns. Mitt Romney, the CEO of the Salt Lake Organizing Committee, was hailed worldwide for his effort in bringing the games to reality after rescuing them from a financial crisis. He used the goodwill as a launching point in his political career, serving as governor of Massachusetts from 2003 to 2007, and running for president in 2008, 2012 and 2016. Romney just won a midterm election to be named senator from Utah. He hailed the selection of Salt Lake City for the USOC's candidate for the 2030 Games. Beijing was named as host for the 2022 Winter Olympics, while the host for the 2026 Games has yet to be selected. The IOC will be choosing between Stockholm and Italy's two-city bid of Milan and Cortina d'Ampezzo.